Hewlett-Packard has a collection of official HP-20b information posted here. A series of very informative learning modules have been created by Gene Wright for HP. These modules expand in much greater detail on the features and functionality of the calculator. Each includes many examples, and the modules are divided into common use cases. 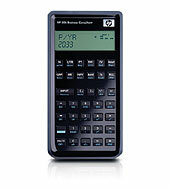 The HP-20b is a new breed of calculator for Hewlett-Packard, and one that reflects a casual open maturity. A group of HP calculator enthusiasts have begun work on repurposing the HP-20b for other uses, primarily enabled by accessing the JTAG connector on the main circuit board. This is a work in progress, although the group is actively soliciting individuals to help with this effort.